FBI Director James Comey on Monday echoed President Obama's statement that the Orlando shooting was not a plot directed from outside the United States and he also outlined the agency's previous interactions with the shooter. The FBI first became aware of the shooter, Omar Mateen, in May 2013 when he was working as a contract security guard and he made statements that were "inflammatory and contradictory," Comey said. Mateen told his co-workers at the time that he had family connections to al Qaeda and that he was a member of Hezbollah. Comey pointed out that Hezbollah, based in Lebanon, is a "bitter enemy" of the Islamic State in Iraq and Syria (ISIS) to which he pledged loyalty in 911 calls as the attack unfolded early Sunday morning. During the 2013 investigation, the FBI followed Mateen, introduced confidential sources to him and he was interviewed twice, Comey said. Mateen admitted that he made those statements to his co-workers, but he explained that he said them in anger because his co-workers were teasing him. After a 10-month preliminary investigation, the agency closed its probe. During an off-camera briefing with reporters, Comey said Mateen was on a watch list when he was investigated, but he was removed "quickly" when the investigation was closed. Two months later, in July 2014, Mateen's name surfaced again in an indirect way, Comey said, because he knew a Florida man casually who blew himself up in Syria. Comey said they both attended the same mosque in the same area of Florida. Comey said the inquiry eventually continued, focusing on the suicide bomber with no further focus on Mateen. In the middle of the attack at the Pulse nightclub in Orlando early Sunday, there were three calls between Mateen and 911 dispatchers, Comey said. First, Mateen called and hung up, then he called again and briefly spoke to a dispatcher and then the dispatcher called again. "During the calls, he said he was doing this for the leader of [ISIS], who he named and pledged loyalty to," Comey said. "We will leave no stone unturned and we will look all day and all night to understand the path to that terrible night," said Comey, who is refusing to name the shooter because he said he doesn't want to be part of his "twisted notion of fame and glory." Comey said the FBI will review its practices, but said, "I don't see anything in reviewing our work that our agents should have done differently." 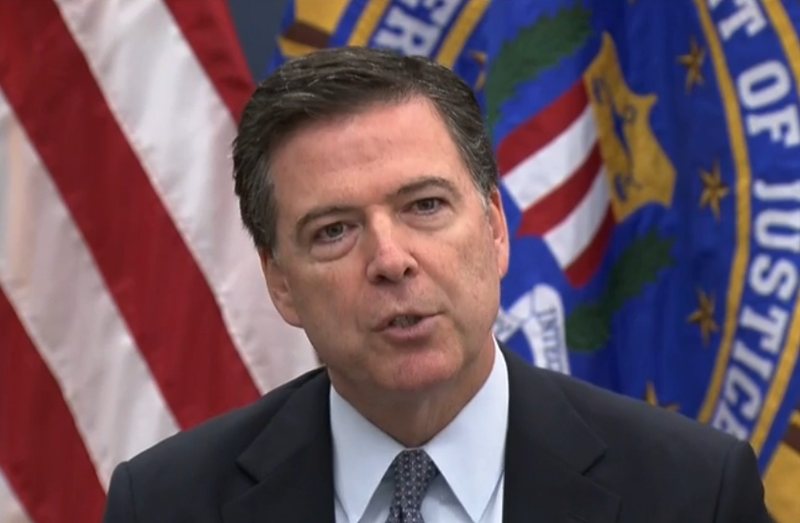 "We are looking for needles in a nationwide haystack," Comey added. Asked if the FBI is looking at the shooter's father, Comey said, "No comment" and he also wouldn't comment when asked if Mateen's family is cooperating. The attack is being treated as a domestic terror incident and it is the worst mass shooting in U.S. history. Forty-nine people have died and 53 people were injured.